Put the oil, garlic and spices into a bowl and mix well. Add the chicken to the marinade, mix and leave to marinate at room temperature for 30 minutes. Thread the chicken and vegetables alternately onto the skewers. Brush any remaining marinade onto the peppers and onion pieces. Put on a cooking grate and cook directly over a medium heat source for 10-12 minutes, turning halfway. 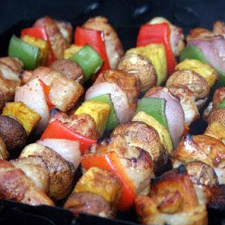 COOK'S NOTE: You could cook these kebabs under a medium-hot grill for 10-12 minutes, turning once. Cherry tomatoes are also good on these skewers if desired. Per Serving (per skewer): 142 Calories; 6g Fat (37.0% calories from fat); 1g Saturated Fat; 13g Protein; 10g Carbohydrate; 3g Dietary Fiber; 26mg Cholesterol; 36mg Sodium. Exchanges: 0 Grain(Starch); 1 1/2 Lean Meat; 2 Vegetable; 1 Fat.